Xi’s stop in Zimbabwe provides a glimpse of the pros and cons of economic dependence on China. Chinese President Xi Jinping spent Tuesday in Zimbabwe, the first stop on a two-country trip to Africa. It was the first time a Chinese president had visited the country since 1996. Bilateral relations, to this point, have been almost entirely based on economics. China is Zimbabwe’s second-largest trading partner, trailing only South Africa. According to China’s Ministry of Foreign Affairs, China-Zimbabwe trade was worth $1.2 billion in 2014, with exports from Zimbabwe to China – mainly tobacco, cotton, and chromium ores — making up over two-thirds of that ($837 million). Zimbabwe’s diamonds have traditionally been a major factor in trade as well, but the country’s diamond exports worldwide have plummeted over the past two years, from a high of over $650 million in 2012 to just $350 million in 2014. In general, the stereotypical vision of China-Africa trade holds true for Zimbabwe: Beijing imports natural resources and agricultural products, while exporting manufactured goods. Amid a global slowdown in the commodities trade (driven, in part, by China’s economic cooling), Zimbabwe is hoping to find new avenues of economic productivity. 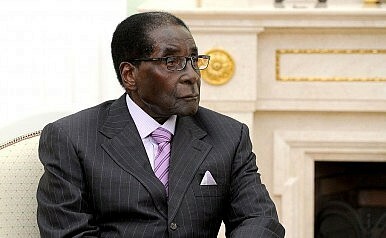 Mugabe was particularly hopeful that China could deliver by providing an investment boost for his country. Zimbabwe was in an economic free-fall for the first part of the 21st century, with the country’s GDP believed to have shrunk by over 50 percent from 2000-2008. More recently, the global economic doldrums, combined with a severe regional drought, have combined to put the brakes on economic growth, which is estimated at just 1.5 percent this year. With heavy sanctions on the country due to Mugabe’s record of human rights violations, China represents one of the few avenues for foreign investment open to Zimbabwe – and Mugabe knows it. Just before Xi’s visit, Finance Minister Patrick Chinamasa told African News Agency that “there is a lot of interest in all sectors of the economy from Chinese investors.” He said that Chinese investment could help entice interest from other foreign firms. While Mugabe might welcome the investment, The Zimbabwe Independent slammed China for saddling the country with nearly $500 million in loans in exchange for construction projects that are “over-priced and of poor quality,” according to an engineer who spoke with the paper. The Independent also complained that Chinese construction firms are given preferential treatment in construction contracts, at the expense of local firms (a particularly sore subject as Chinese companies generally bring their own specialists and laborers from China, rather than hiring locals). Those concerns were nowhere to be found in the official rhetoric surrounding Xi’s trip. Instead, both countries touted a series of new investment and construction deals, including a $1 billion deal to expand a thermal power station at Hwange. According to ANA, Chinese firms are also in talks to complete three other private-sector energy projects, each of which will provide 600 MW of energy. Chinese companies will also build a new parliament building and a pharmaceutical warehouse, Reuters reports. Beyond economics, Xi also took time to visit a wildlife sanctuary in Zimbabwe, where he pledged that China will provide more support to Zimbabwe’s wildlife protection efforts. In recent years, China has been trying to fight criticisms that demand for ivory from its increasingly wealthy citizens is causing increased poaching of endangered African species such as elephants and rhinoceroses. In September, while Xi was in the United States, China and the U.S. signed an agreement to effectively ban the ivory trade – a move long seen as a crucial step in stemming poaching. Xi also signed a cooperation deal on wildlife protection while in Zimbabwe. Xi’s stop in Zimbabwe is part of a larger African tour. The Chinese president has already arrived in South Africa for a state visit, and from December 4-5 he will chair the Forum on China-Africa Cooperation (FOCAC) in Johannesburg. This year’s FOCAC summit brings together the Chinese leader as well as top leaders from African countries; the last full-on summit was held in Beijing in 2006, with 48 African leaders in attendance. As Xi attends his first FOCAC summit since taking over China’s top leadership role, he’ll want to put his own stamp on China’s ties with Africa. In that sense, the outreach to Zimbabwe should be considered a preview for what Xi has in mind for China’s overall cooperation with the continent – which involves expanding the relationship into new areas of cooperation on energy projects, industrialization, and agricultural modernization, in addition to the traditional focus on transportation infrastructure. Parsing China's relationship with African dictators, like Robert Mugabe of Zimbabwe.